This is Andrew Cuomo, the governor of New York State. This is a very wicked man. You've probably heard that New York State has just passed the most liberal abortion laws in the nation. We who watch the political balance in N.Y. knew this was coming. I blogged about it HERE after the election last year. 1. It redefines what a human is. Any child not born is not human, and has no human rights. Thus, there is no longer any crime committed against unborn children in cases where pregnant women miscarry after being assaulted. 2. It allows abortions up to the time of birth for any reason. No ambiguity. 3. It allows abortions to be performed by medical personnel other than physicians. 4. It makes it legal for viable babies born alive following late-term abortions to be denied medical care. So now, in my state, unborn children can be legally killed at any time before they are born, and if they happen to survive an abortion (which occasionally happens), they can be left to die. Furthermore, abortion is no longer "a matter between a woman and her doctor" because non-doctors will now be able to do the killings. By passing the [Reproductive Health Act], the State of New York has embraced the proposition that some living human beings do not deserve the protection of our laws. This proposition flies in the face of our American tradition of respect for human life. Without the right to life, the other rights guaranteed in the Constitution have no meaning. Contrary to the rhetoric of RHA advocates, abortion access does nothing to advance the rights of women; rather, it invites both women and men to view unborn children—their own unborn children—as disposable objects. ﻿Instead of celebrating the passage of the RHA as a milestone, New Yorkers for Constitutional Freedoms views the passage of this bill as an occasion for mourning. Our state needs a course correction—not just legislatively, but also morally and spiritually. May God have mercy on our benighted State of New York, on women, and on the unborn. I had to look up the word "benighted." One definition is: "in a state of pitiful or contemptible intellectual or moral ignorance." Another definition is: "overtaken by darkness." The word is so appropriate. One of the mostly legitimate functions of government is to establish and enforce just laws, and to punish evildoers. But what happens when traditional understandings about right and wrong are changed? What happens when government goes from punishing evildoers to protecting evildoers? And furthermore, it even promotes and encourages evil through it's laws? I was 15 years old in 1973, when the Supreme Court Roe v. Wade decision was made. At that time I was ambivalent about abortion. I really didn't see any problem with it. But I really didn't know the facts. When I actually read about the abortion procedures, and I saw the pictures of aborted babies, I knew in an instant that it was wrong... I knew that it was evil. That video breaks my heart like nothing else can. Only a psychopath could watch that and not be impacted by the wickedness of it. In a previous blog post I made the observation that humans have an incredible ability to justify the worst kinds of behavior. You won't find a better example of this than abortion. Unfortunately, that video has precious few views. But I understand why. I really didn't want to watch it either. My wife and I have financially supported our local pregnancy care center for many years. And we have supported other such organizations from time to time. Many thousands of Christians have done this since 1973. Why? What do we gain by trying to save the lives of unborn babies? Do we profit from this? No. Not at all. We do it because we're horrified by the abortion industry. It lies to women, it kills their children, and it profits immensely. Last fall my wife and I, along with a few people from our church stood for a 1-hour "shift" across the street from the abortion provider in Ithaca, NY. We stood silently, holding signs. Ithaca is a liberal enclave in the middle of conservative upstate NY. Some people driving by expressed their anger towards us. It was an uncomfortable experience. But, in reality, I have not done that much to battle for the life of unborn children. I feel guilt and remorse about it. I like to watch Greg Hunter's YouTube programs at Watchdog USA. He was once an investigative reporter for CNN. Greg is a passionate guy. I don't always agree with his interviewed guests. For example, I don't even listen to the interviews with Mark Taylor, because I'm just not interested in anyone's prophetic prognostications. But Greg gets some good economic insights from some guests. Greg always ends his YouTube shows by telling his audience to "fear not, because God the father and his son Jesus Christ are in control." I agree with part of that. I believe that God is sovereign over His creation and intimately involved in history, down to the smallest of details. But fear not? That part I question. Frankly, I fear God. I fear His justice, His judgment, and His wrath on nations that have turned their back on His law. Nations that not only exalt unrighteousness in so many ways, but flaunt it. Nations like America. I harbor no illusions about the goodness of America. We have forsaken the Godly foundations of the American Republic. We have squandered our inheritance. We are a wicked nation. God owes us nothing but smoke and ashes. Laws, once passed, are not easily reversed. From my human perspective, I see my nation in the midst of collapse on several fronts. It is accelerating. I'm not optimistic about the short term prospects. But I still have hope. My hope is that the inevitable consequences of national sins will eventually lead to national repentance—that out of the ashes America will return to being a nation that fears God. Time will tell how it all plays out. Meanwhile, I am thankful for the mercy and grace God extends to his people in the midst of the storms of life and history. 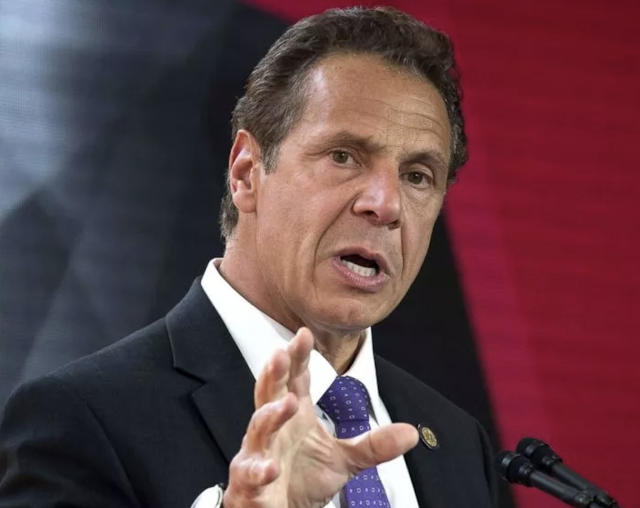 Prior to signing the bill, Cuomo told supporters, “Today is sweet, because in a few minutes, I will sign this bill..." Sweet??? I'm not sure there are words to describe this dispicable act. And the women who were standing next to him when he signed the bill, all smiles!! Smiles!!! I suppose next we will be seeing Gosnell walking free. All I can say is God is long-suffering. There was a video circulating of the cheering that went on when Cuomo signed that abortion bill that is just sick to watch. I am guessing he will run for president and that would finish us as a country. Can't get any more wicked than that. Hey Ron, this country is already finished, we just have to stand here and watch all the liberal/progressives remove the rest of the building/supporting blocks of this particular civilization. It three words, We Are Screwed! I am constantly reminded of Matthew 24. It certainly looks like we are near the end times, but I have no idea where we are in His story. We may still have 10 to 100 years to go. I do not think it is time for us to give up and head for the hills. I think we need to earnestly contend for the faith and try to bring just one more soul home. I have no idea how bad things were in the day of Noah. I have no idea how bad things can get. Just when you think it can't possibly get worse, it does. I am guessing there will be a "Crash and Burn" but I am curious to see what comes after that should the Lord tarry. My husband & I watched a documentary about Kermit Gosnell (titled: 3801 Lancaster: American Tragedy) It is so stunning that there are just no words for it. Not only is he a monster but he was allowed to continue his butchery by the state of Pennsylvania! Everyone in that state that had any medical oversight turned their backs on those precious lives! For years and years and years!! I know God is not mocked. He knows and we will receive just recompense for this continuing evil. This NY state evil will make sure that monsters like Gosnell will be emboldened. We are a sick and dying nation with wounds that are self-inflicted. I was saddened by it all but especially seeing the elderly gray haired lady at the signing smiling so broadly. I have 15 grandchildren and I'm so glad they have life. I want that for all the babies. if not the beginning of birth pangs of the end times then surely a peal of the bell in the death knell of this corrupt nation i haven't given up, i pray that this country will become a haven for the persecuted Christians from all over the world. that they will be welcomed here and pray for our nation and the world. it increases the prayer power , the intercession for the world we know scripture tells us it ends terribly before the old things pass away and the new heaven and earth arrive. we are living in stunning times. keep prayed up and fast some if you are able. Elizabeth L. Johnson said, Thanks so much for this post, Herrick. God bless you, Marlene, your boys and fams. Copyright by Herrick Kimball, 2018. Awesome Inc. theme. Theme images by Nic_Taylor. Powered by Blogger.